Today ... wait .. not quite as today since it's already midnight.. Or should I consider this as yesterday? Well, whether it's today or yesterday it is still Raya mood (Malay's new year). Whatever the occasion, the main event in this post is to share the food I had tasted today. Yes, The "Taste of The Chuan's" (the Chuan Wei Ren Jia, as shown on the signboard). Initially, an eating kaki of mine, Kir, who just came back from Sydney would like to bring me to taste the Korean food somewhere in Tanjong Pagar. However, to our disappointment the shop only starts its business at 5pm due to Raya...argh...not knowing what to eat we just loiter around Tanjong Pagar to see if there is any other restaurant..But there was just none...*Fainted* But thanks to Yixuan, we get to fill our stomach a bit. Cutting the story short (which I think you guys will not be interested on how we got to this restaurant), we decided to try the above mentioned restaurant in Chinatown. I got know this restaurant from the research assistant, a part timer hired by my supervisor, Zhang Yan. Thanks to Zhang Yan patience I am able to taste such a good food. A little background before I introduce the food (good things always come last..hehehehe), this restaurant is a Northern Chinese Cuisine, specifically Szechuan Cuisine. Due to my blur personality, it took me a while to find the main door of the restaurant. We saw an arrow sign showing to the left and I thought the door was on further left. Actually, it's a sliding door... Gosh I am so paiseh (embarassing) ... However, I just acted selamba-ly (act as if nothing happen in Malay) walking into the restaurant. The first impression of the restaurant to me was clean. Very clean. The waiter is somehow quite helpful cos when I said I do not want to sit by the door, he open another section for us to dine in. Upon sitting down, I observed the place a little. It gives a cosy, homely and warm feeling for those people who studied or worked outside their birth country, especially those who are from China. It give you a sense or rather a taste of home compared to most restaurant which are quite commercialized. It's quite spacious and not too crowded in terms of decoration. Simple and nice plus the way the boss decorates the restaurant makes you feel welcome and a sense of belonging.. I guess this is why most customers were from China and they make the restaurant even livelier. Alright, alright I know, I know, you guys are growing impatient. Here comes the main part. Yes, the food. 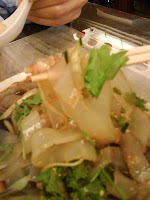 Since there was only two of us, we can't order much though there are a lot of other dishes we would like to try. We ordered five dishes....here goes~~ TADAAAAAAAAA!! Feeling tempted? Okay, let's start off with the cold dish or appetiser of the meal, followed by the main dishes. If you are a spicy lover, this is a must try. If you are a dieter, you may now like this dish (it's really totally and very sinful). Because this dish is fully covered with spices oil. The nice part of this dish despite its "oiliness" is the meat. The meat covered with flour is very very tender. They feel as if they are ready to melt inside your mouth. It tastes like chicken but the fact is we ordered pork. What amazed us is how can a pork taste like the texture of chicken? I would say this is a good dish. I cant figure out what spices they used except the dried "chilli paddies" that is being covered. Due to the spiciness and Kir are unable to stand this, we took away this dish and of course, I was the one who ending up finishing it. Thanks Kir for settling my dinner. Hahahhahahaha... Ok ok back to the topic. The spiciness of this dish will not numb your tongue like others type of food chillies combi. However, you will choke your throat once in while. So be extra careful when you ordered this dish. P/S: Oh ya, nearly forgot. They offer steamboat buffet as well and the ingredients are really very fresh compared to the ones I had eaten in Bugis. They charge 18++ for adult and 12++ for kids.